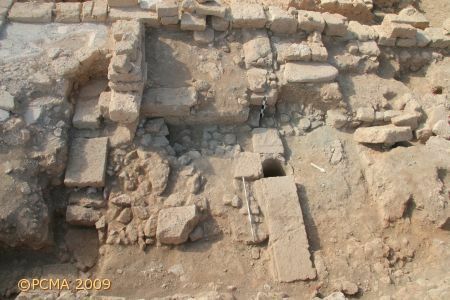 The 2007 season of excavation was unusual, as it consisted of two phases. 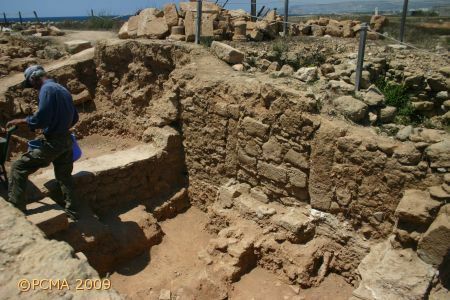 In the spring extensive emergency work was carried out of previously unexcavated ground in places where the Cyprus Department of Antiquities plans to put up a shelter protecting the remains of an ancient residential quarter uncovered by the Polish Mission in the course of the past forty years of research. 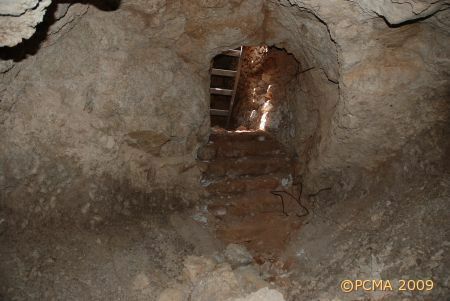 Fieldwork was conducted by members of the Polish Mission, who supervised, with short interludes, the excavation work, documented the stratigraphy and recorded the finds. 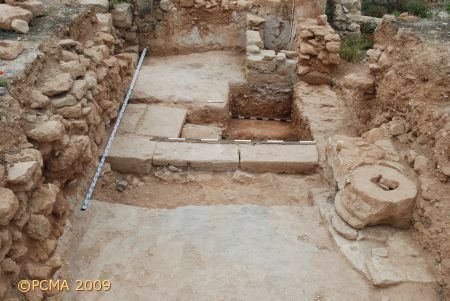 Regular excavations were resumed in the autumn, concentrating fieldwork in the northern part of the insula occupied by the House of Aion, in the southeastern corner of the Hellenistic House (HH) to the south and in the northeastern part of the Early Roman House (ERH). Further emergency work was conducted in the southern part of HA. A 38 m long stretch of this main street leading to the harbour was excavated to the level of the slabs covering a large drain which was partly rock cut and partly masoned. As already observed in the eastern part of the trench, the drain was destroyed already in antiquity and superseded by a clay pipe [Fig. 1]. That part was also cut by deep trenches in modern times. Among the finds from this heavily disturbed area there is a small marble head representing possibly one of the young members of the Ptolemaic family. 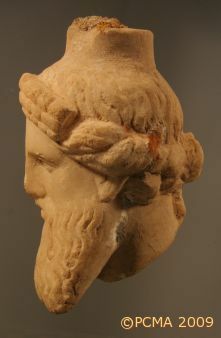 The head carries a diadem and a ram horn of Zeus Ammon on the left side of the head, well modeled in a typical Hellenistic style [Fig. 2]. The right side differs from the left. Here the original sculpture was evidently modified as it now shows features of a Cypriot style with flat representation of the eyes and generally cruder workmanship. The strata here, including Late Roman floors, have been disturbed by a metalled road and the accompanying water pipe leading to the RAF meteorological station. The Late Roman structure these floors were part of comprised an oblong internal courtyard with a drain leading to a cistern at its northwest corner [Fig. 3]. The over-floor deposits accumulated in the 5th century AD. 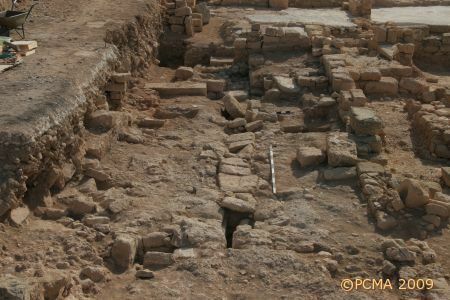 In the deeper trenches parts of an Early Roman building were uncovered. Its walls, built of well-cut masonry blocks, were destroyed in the 2nd century AD [Fig. 4]. 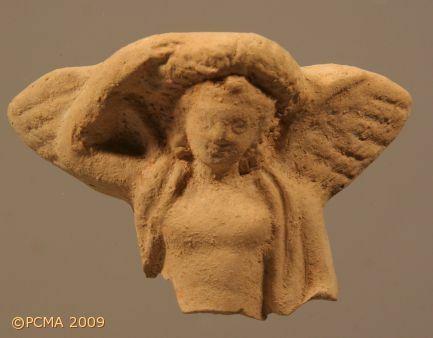 Among finds from the earlier phase there is a terracotta Eros figurine [Fig. 5]. The vicinity of the north courtyard of the Early Roman House was excavated. The collapsed north wall of rooms 1 and 6 to its south was uncovered revealing decorated plaster still preserved on its upper (that is, inside, southern) face. The earthen surface of the courtyard was found immediately underneath, on a level c. 0.80 m below the floors in rooms 1 and 6. Finds on the floor place the destruction of the house in the 2nd century AD [Fig. 6]. A trial pit made beneath the east wall of the courtyard brought to light evidence of an earlier Hellenistic building on this spot. 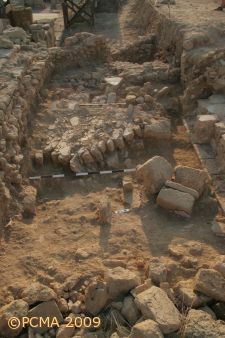 At the southeastern end of the building, two small rooms were excavated. In the rubble fill of these structures, a well-preserved marble head of a herm representing the old Dionysus was found. 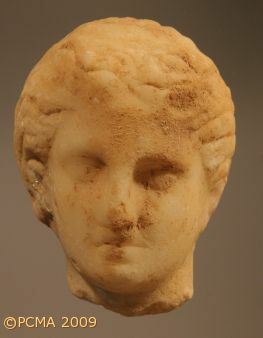 It is made in an archaizing style with a cylindrical support on the top of the head and traces of an iron clamp that had probably connected it with the main sculpture of the group [Fig. 7]. At the opposite side of this building, north of the western courtyard (no. 13), a row of four rooms (20-23) was uncovered, the floors here being at the same level as the courtyard. The northern side was cut by the foundation of the south wall of the Villa of Theseus complex. Room 20 opened into the courtyard through a door in an altered wall. The eastern door jamb was made of a large re-cut column base, which may have belonged to the original northern portico of this courtyard. Another such base was found on the southern side of this courtyard, similarly included in a wall. The reconstructed size of these columns is the same as in the case of the base found in the western portico of the main courtyard of the house (no. 1) [Fig. 8]. The room was divided by a line of large blocks running north-south. Under the floor to the east, a roof of slabs covered a corridor leading to a large cistern. The slabs are horizontal in the north and gabled in the south. The cistern lies to the south, disappearing under the still unexcavated part of the courtyard (no. 13) [Fig. 9]. and later through room 21, which communicated with room 20. These rooms had a household character and their destruction deposits contained numerous complete or almost complete pottery cooking pots, jugs, amphorae, lamps, as well as a set of glass rectangular aryballoi, lead weights, some iron tools, lumps of native sulphur. This group of finds is dated to the beginning of the 2nd century AD. South of the Hellenistic and Roman Houses a long trench was made in street A’, uncovering a Roman drainage pottery pipe and a superimposed E-W wall at the eastern end of the trench, dating to the Late Roman period. In a small trench west of the western wall of the Villa, in the southern part of the enclosure, remains of late Roman walls were uncovered. This suggests that at least here, the back-space of the Villa was not only a garden as was previously thought, but that the western wing extended westwards in a phase of use later than the laying of the Poseidon mosaic in the Villa of Theseus. A trench was also made below the floor of room 17 of the Villa, uncovering a continuation of the main street B and its large sewer. 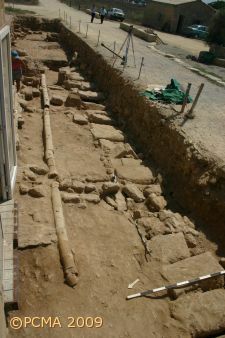 This trench also demonstrated that the street, which in later times was completely built over, was already partly covered in Early Roman times. cooking vessels, jugs, and a large tableware jar were found in the small compartments placed west of the main NS wall. The pottery can be dated to the end of the 1st and beginning of the 2nd century AD. This group of finds suggests a household character of the rooms.